You really can’t go wrong with chilli con carne. It’s always such a crowd (or husband) pleaser. Well that’s what I remind myself when, once again, it is my go-to dish for turning mince beef into a feast. 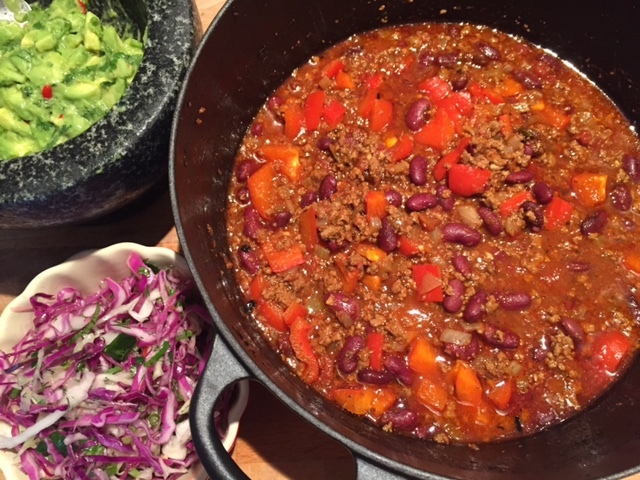 After many chilli con carne dinners this year I thought it was about time I shared the recipe before 2015 comes to an end. I wanted to start with a brief ‘official’ description of chilli con carne. So I looked online hoping to be inspired with stories of the dish’s rich Mexican history. Instead Google disappointed me with “a stew of minced beef and beans flavoured with chillies or chilli powder”. In reality chilli con carne is so much more than that this suggests. It’s rich, hearty and smokey with a deep flavour that comes from spices such as cumin, paprika and cinnamon; combined with ingredients like cocoa powder, coffee and possibly even balsamic vinegar. After lots of experimentation I’m sharing my recipe here – with a few twists so you can make it your own. This recipes serves 2-4 people depending on the amount of sides (leftovers can be easily frozen). Bring the meat to room temperature 30 minutes before cooking. Add half the oil to a good sized pan on a medium to high heat. Once the oil is hot add the beef. Cook until brown – adjusting the temperature so the meat doesn’t stew but browns quickly. Remove the meat from the pan and reserve in a bowl. Add the remaining oil to the pan on a medium heat. Add the onion followed a few minutes later by the garlic. Be sure to avoid the garlic burning. Once the onion is soft add all of the spices except the oregano. Return the cooked meat to the pan and stir through the tomato puree. Add the beef stock (or espresso or beer) to the pan along with the tomatoes and oregano. Season with salt and pepper. Give everything a good stir and bring to the boil. Then turn down the heat to a very low simmer, cover and cook for 1-2 hours (the longer the better). If the sauce is drying out too much add a splash of water. 40 minutes before the end of the cooking time add the pre-soaked kidney beans (20 minutes if you’re using canned beans). Remove the cover if the sauce needs to thicken slightly. Add the diced red pepper/capsicum (optional) 10 minutes before you turn off the heat. Serve with a fresh cabbage salad, flat breads, homemade guacamole and lots of fresh lime. Replace the beef stock with 200ml espresso style coffee or 250ml beer. Add extra chilli powder or a fresh chilli to dial up the heat. Experiment with adding a square (10g) of dark chocolate or 1/2 tsp cocoa powder at step 5. Jamie Oliver’s “Winter Nights Chilli” recipe includes a splash of balsamic vinegar, some butternut squash and fennel seeds. Replace 200g tomatoes with chipotle peppers in adobo sauce. A chipotle is a smoke-dried jalapeño pepper (look for the canned version in sauce). 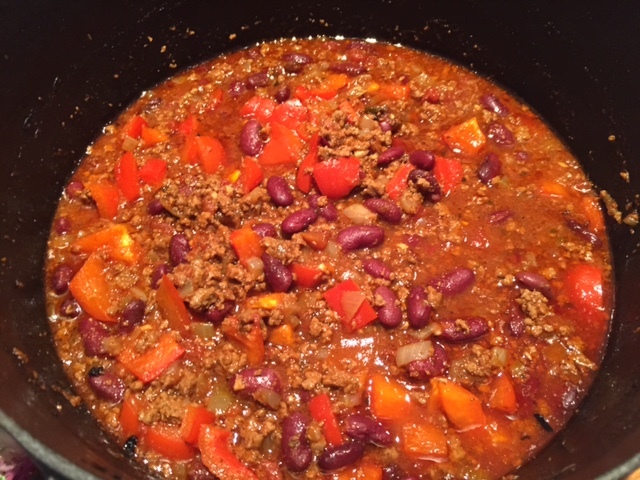 Just as I’d drafted this post I saw a great recipe for chilli con carne on rusticplate.com – if you’re keen to know lots more about chilli con carne check out Serena from Rustic Plate’s post for velvety steak chilli with butternut squash & dark chocolate. 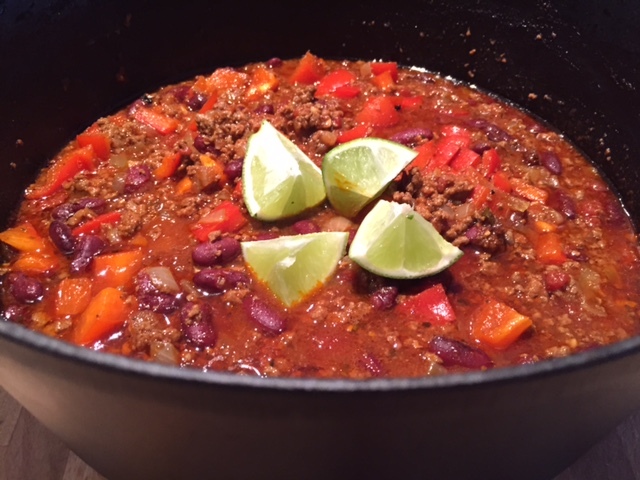 Tags: beef, chilli con carne, Mexican, recipe. Bookmark the permalink. Thanks Linda – and yes it is…..
wow, love the idea of adding coffee instead of stock! V creative. Thanks Hungry Mum – it works really well, especially when you don’t have stock to hand…. Thanks Chitra – it is…. I like the special twists I see here and the fresh tomatoes! Yum!